Ever since I received the name of my Secret Stitcher for the Stitcher's Angel Swap, I've been trying to come up with some ideas for what I would like to make for her. I checked out the first two free projects that the designers have posted for the swap, and I really like both of them, but I really want to make my gifts unique. I had a thought today for one of the gifts. A book I have had for many years has provided me with inspiration many times when I needed or wanted to make any type of bag, and that is one of the things I want to make for my Secret Stitcher -- a generously sized tote bag. 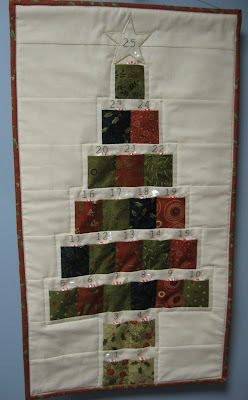 She is a quilter after all, and we all know how big quilts can get even while in progress! The book is called "Hold It! How to Sew Bags, Totes, Duffels, Pouches, & More" and one of the tote patterns in it has become My Absolute Favorite Bag of All Time. This is a picture of the tote bag holding six 7-ounce skeins of yarn and my Basketweave Afghan which is about two-thirds finished now. It isn't really a Huge tote bag, 20" x 14" x 6", but it sure holds a lot! It is Project 10 in Hold It! and is called Expandable Zippered Tote. The top part of the bag, striped in the picture above, has a zipper down the middle and is shown in its expanded state. If the bag were not so full, that top part could be tucked down inside the bag, hiding the zipper. I made this bag using discontinued upholstery samples from my local furniture store where a friend of mine worked. The bag is completely lined and has a large pocket sewn into the inside on one side. The handles are made of 1" webbing. For my Secret Stitcher, I think I would choose two or three nice fabrics in her preferred color scheme and some denim. I love working with denim. 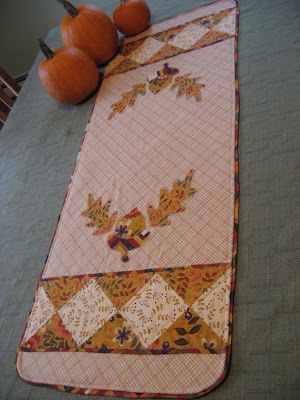 I am planning to embroider a decorative panel for the outside on one side, and perhaps make it into an outside pocket. I hope this is something she will like and be able to use. Now back to the book...ooooh, The Book! I love little books like this. 132 pages, paperback, 22 different projects of all shapes and sizes and for all skill levels from beginner to expert with many variations on each, clear directions and diagrams. There are chapters for Flat Bags, Totes, Duffels, Cases, and Rolls & Pouches. Lots of colored pictures of finished projects in various forms. Very inspirational if you're into bags! Check it out if you'd like and see for yourself. Once I get my Secret Stitcher's tote bag underway, I will certainly share the details so come back and check it out.